Submitted by mahoney on Thu, 07/24/2008 - 12:46pm. 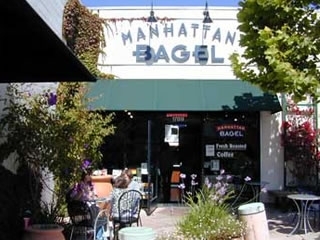 Manhattan Bagel USA...Manhattan Bagel is about authentic food for real people, served in a way that suggests each customer is a treasured neighbor. Their authentic food includes their award winning boil and bake bagels, and goes right on to their mouth watering, freshly baked pesto focaccia bread sandwiches served as breakfast or lunch Tostinis. Oh, and don't forget the taste sensation that only an authentic grill can bring to real eggs and bacon. Their incredibly tasty sandwiches are made to order and are offered on a huge variety of freshly baked choices - over twenty varieties of bagels, pesto focaccia bread, asiago, sesame or plain rolls, and honey tortilla wraps. NOTE: If there is a Manhattan Bagel location I have left out please email me and I will be happy to add it to the file. Updated the file using the latest website listing. Updated the file to the latest data from the Manhattan Bagel website locator.